Obedience training is the engine that drives TCOTC, and Jane Jacobson is the engineer that drives the Obedience Department. 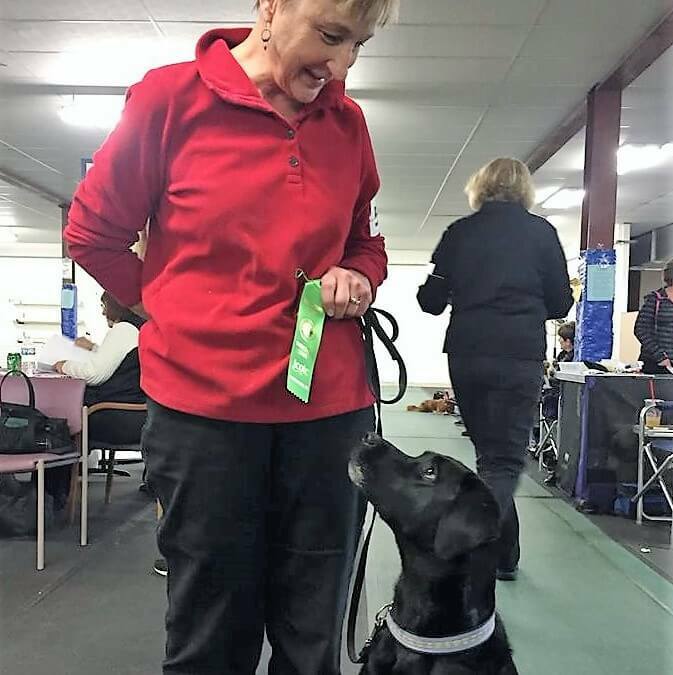 As Obedience Department Head, Jane’s job includes everything from developing curriculum, scheduling classes, training and supervising instructors and assistants, and teaching classes. As a long-time club member and instructor, Jane is probably the most recognized of all the staff at TCOTC. Like many members, it was a “crazy” puppy (a Lab, of course!) that led Jane to TCOTC. An earlier experience training elsewhere with a dominance focus left her feeling unsatisfied and her dog feeling more stressed, not less. Her new puppy needed “positive reinforcement” to thrive, so she began taking classes at TCOTC. After a few years of successful training, her instructors encouraged her to become an assistant instructor and, eventually, a full instructor. Jane sums up her philosophy on dog training this way: “Obedience training is about developing a positive relationship between dogs and their handlers. We want to give dogs the skills they need for living in a human world. It not only makes life easier for the human but is far less frustrating for the dog when it knows your expectations. Anyone who doubts the value of a strong obedience foundation for sports should watch Jane run her lab, Lily, on the agility course, to see the distance and speed she is able to achieve. Jane continues to train her 12 ½ year old lab. His latest skill is stepping back to put his two hind legs on a raised box. Jane sees it as physical therapy to work his core and hips to maintain flexibility. He sees it as a fun trick for which he is rewarded. Jane recommends competing in obedience as a way to forge a strong bond and keep a dog mentally and physically engaged throughout its lifetime. It’s challenging, fun and rewarding. “The precision work between dogs and their handlers in competitive obedience is dramatic, like a dance performance,” says Jane. Those contributions go beyond her staff role. She is a frequent volunteer, well known for fabulous egg bakes and other delicious food that she prepared for crowds at TCOTC Trials, designing and installing landscaping to create our tiered potty area, painting, cleaning and pulling out her knitting at board meetings or whenever there is a spare moment. Thank you Jane for all you do to keep TCOTC the Premier Club of the North!